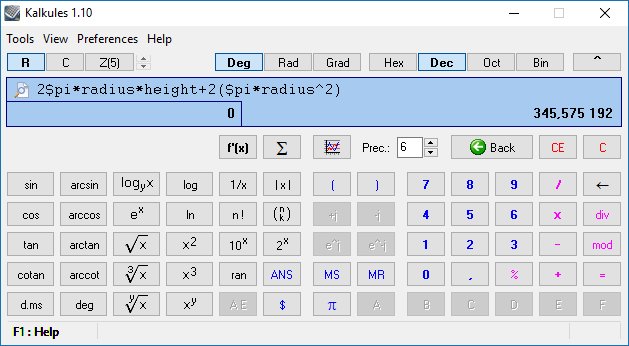 Kalkules is an universal scientific calculator that comes with many nontraditional functions and built-in tools designed to make your calculations easier and faster. How to extract: Download the ZIP package and extract to a folder of your choice. Launch Kalkules.exe. To disable update check at startup, edit settings.ini and change the CheckUpdatesAtStart=1 to CheckUpdatesAtStart=0 or launch Kalkules.exe and open the Preferences tab. Uncheck 'Check for updates at start"
Euler Math Toolbox is a numerical and symbolic math toolbox. Symbolic computation are done by working with Euler's native capabilities and also in conjunction with a seamlessly integrated version of Maxima computer algebra system. 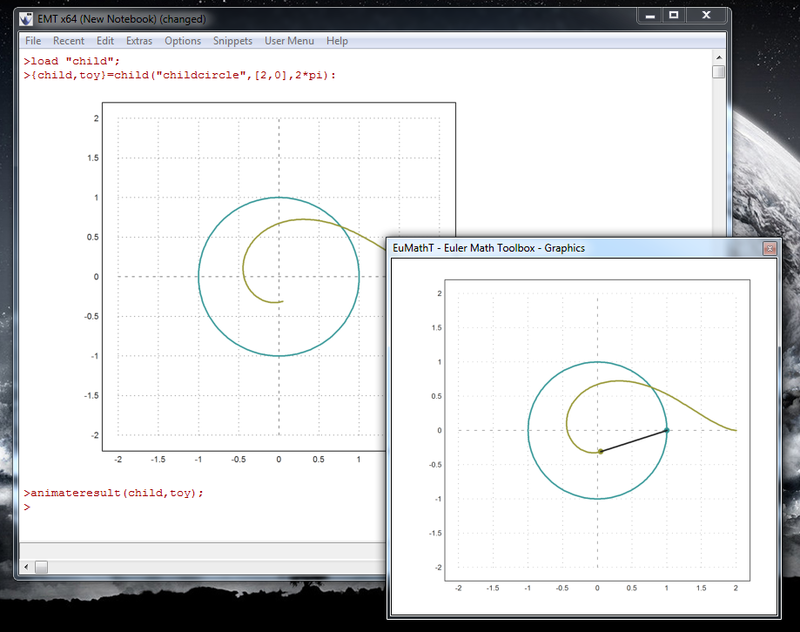 Euler Math Toolbox can also be used with LaTeX and Python (integration instructions). Euler Math Toolbox also supports the capabilities of using the built in C compiler (Tiny C) to run C code for important mathematical routines where high performances are required. The program is developed by a math professor (R. Grothmann) at the University of Eichstätt in Germany. Examples of problems solved with this program. What's new? Full changelog at http://euler.rene-grothmann.de/Programs/Changes.html. Python is an interpreted, interactive, object-oriented programming language. It incorporates modules, exceptions, dynamic typing, very high level dynamic data types, and classes. It has interfaces to many system calls and libraries, as well as to various window systems, and is extensible in C or C++. It is also usable as an extension language for applications that need a programmable interface. Portable Python includes Django web application framework and the Scite Editor. Note: this program is no longer under active development (thanks shnbwmn). I cannot find an .exe file to download. What I get is a .torrent file which universal extractor does not recognize. @ jgermann: Scroll down to the bottom of the download page and use one of the mirror downloads (e.g. USA Rowan.edu). Klick on "HTTP". According to the website, Portable Python is no longer being developed. It would seem that WinPython (http://winpython.github.io/) is its successor. Maxima is a system for the manipulation of symbolic and numerical expressions, including differentiation, integration, Taylor series, Laplace transforms, ordinary differential equations, systems of linear equations, polynomials, and sets, lists, vectors, matrices, and tensors. Maxima yields high precision numeric results by using exact fractions, arbitrary precision integers, and variable precision floating point numbers. 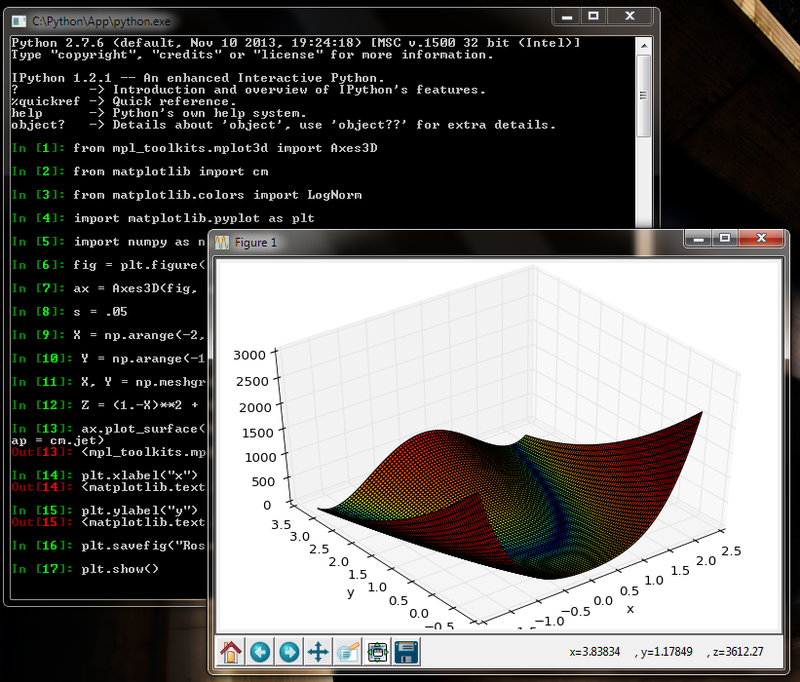 Maxima can plot functions and data in two and three dimensions. Cross platform with clients available for Linux, OS X, and Android (thanks Midas). 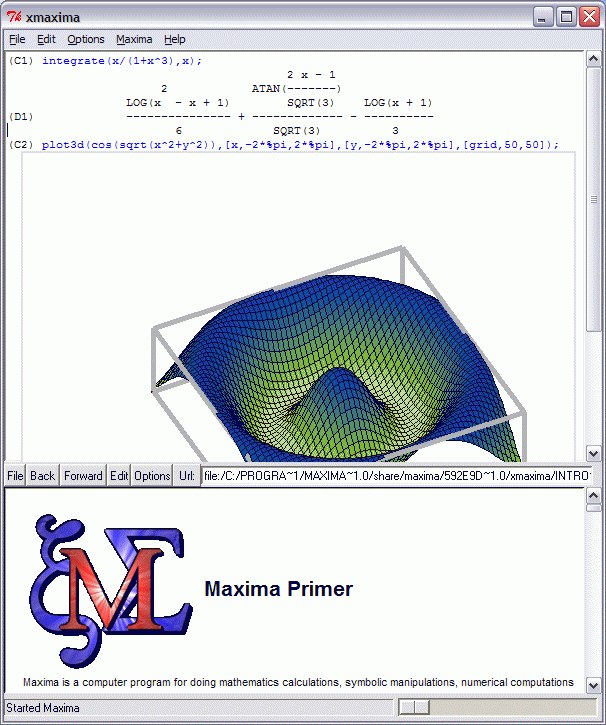 X-Maxima is a portablized version of the program. Alternatively, an unstable Maxima portable package is available from PortableApps.com. How to extract: Download the ZIP package and extract to a folder of your choice. Launch X-Maxima.exe. Graphical Expression Viewer can be used to visualize graphs of common mathematical functions. You can type in functions of the type z=x*sin(y), specify a range and then generate the graph for the function. The generated graphs can be rotated by dragging with the mouse. The application has a few interesting graphs built into it that you can select from. Note: This application requires a 3D card with OpenGL support. How to extract: Download the ZIP package and extract to a folder of your choice. Launch Graphs.exe.